The Magista 2 has been in the making since 2014. In soccer, like most other sports, footwear plays a major role in helping athletes perform at their best. Your shoes say a lot about who you are as a player, and you need them almost as much as you need the ball to play. This week, soccer pros all over the world will test-drive Nike's latest flagship football boot, known as the Magista 2. Unlike the original, released in 2014, Nike says its new model is fully driven by two years of research. Over that span, the sportswear giant relied on collecting athlete data and 3D-printed prototypes to build the design that hits stores tomorrow. It's 30 percent lighter than before, for one, thanks to a soleplate that Nike overhauled using a custom tool called Finite Element Analysis. The FEA system tests traction patterns to build an optimal base for the foot, allowing designers to configure key elements like the placement of studs. What made this scientific testing easier to turn into tangible form was 3D printing technology, says Nathan VanHook, senior design director of Nike Football. A prototyping process that in the past would have taken weeks or even months can now be done in a matter of hours. By relying on 3D-printed plate models for FEA traction, VanHook says his team was able to receive instant feedback from different variation studs. These are sent through a robotic simulator to see which work best for rotation, acceleration and deceleration, until designers and engineers eventually land on the sweet spot. This data help create a shoe that's supposed to perform well on any given day, regardless of the condition of the field -- immaculate, rough, wet, dry or somewhere in between. 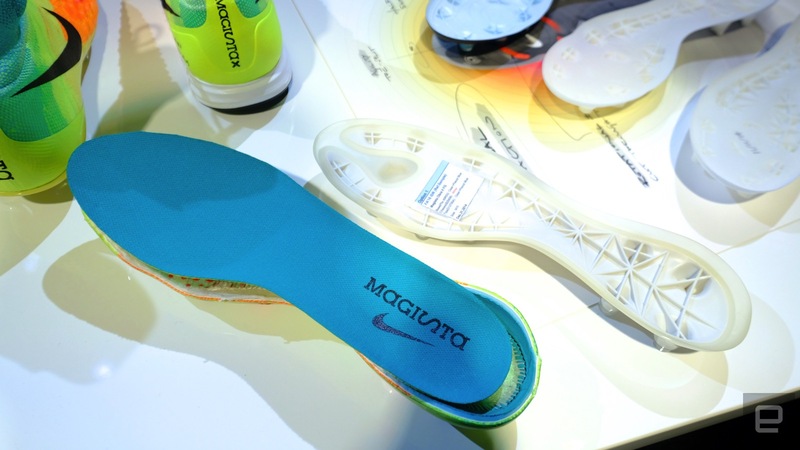 The Magista 2's insole next to a few 3D-printed sample plates. VanHook, who designed one of the most coveted Air Yeezys during Kanye West's Nike partnership, says what he appreciates the most about 3D printing is the freedom it provides to experiment. "You see things right away," he explains. "We can take the lever and say, 'Let's see what the most extreme [thing to do] is,' and are able to prototype and iterate superfast." Put simply, VanHook says, 3D printing has sped up Nike's innovation process tenfold. He says there's no reason to wait to cut metal tooling or mold something anymore, noting that the key is to go from the sketch to the actual making as quickly as possible. As far as design goes, the Magista 2 is arguably Nike's most eye-popping soccer shoe to date. And that's coming from a brand known for its flashy designs on the pitch, including Cristiano Ronaldo's CR7 Mercurials, as well as the HyperVenom and Tiempo lines. Most of them feature colorful, highlighter-like tones that are hard to miss even for fans without 20/20 vision. The Magista 2's "heat-map" design is intended to mimic the hot spots where most players are bound to interact with the ball. In this case, red reveals areas of the foot with high sensitivity to touch. For example, if you've ever played soccer you know how effective it is to kick the ball with the inside of your foot. It provides both power and accuracy. Sure, you don't need a shoe to remind you of that, but it doesn't hurt to have that mapped on your feet for aesthetic purposes. The interesting part about this design is that it was originally used on every prototype of the Magista 2 for data-collection, but Nike ultimately decided to turn it into an actual product. "It was pretty amazing when we first started seeing all the data come in and we painted it up," says VanHook. "It's the simplest idea, but it's really complex how the data came through." Nathan VanHook with Nike's Magista 2. 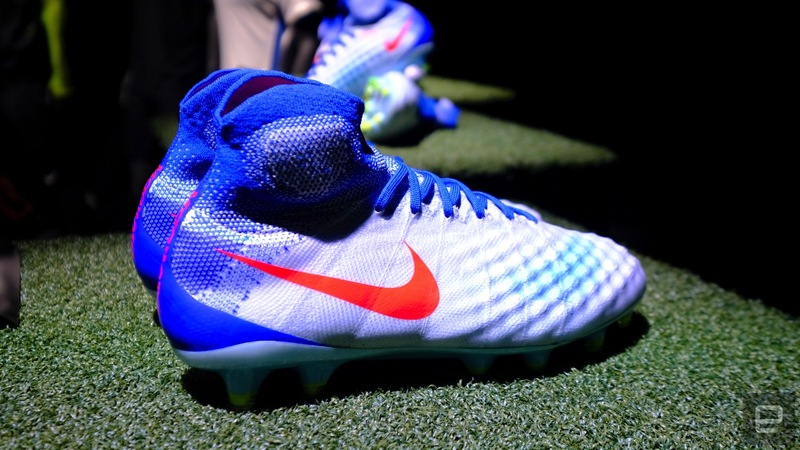 To develop Magista 2, VanHook and the design team needed some in-house assistance. They worked with people from the Nike Sport Research Lab every step of the way, from R&D to prototyping to the influence of the final design. NSRL is basically an underground bunker, located inside the most restrictive building at Nike's world headquarters in Beaverton, Oregon. The $40 million facility, built in 1980, is so secretive that even Nike employees who work in other buildings need to go through a screening process to receive a guest pass. It's an important part of everything Nike does for soccer, basketball, football, running and basically every other sport for which it makes products. Nike is often coy about what goes on at its high-tech lab, but in a sneak peek it posted online in 2014, it describes NSRL generally as a place to "quantify athletes' movements, the environments they play in and they products they use." For this particular project, NSRL provided VanHook the necessary information to create an upper that's designed to offer a better grip on the ball, improved traction and, as mentioned earlier, a lighter-weight design than the first Magista. Similar to what Adidas did with its AlphaBounce running shoe, Nike researchers used motion capture to study how different areas of the foot control the ball. Again, this is what's mirrored on the Magista 2's upper design, which is made out of Nike's trademark FlyKnit material. NSRL isn't just for testing products, however. It's also a facility where athletes go to be evaluated frame by frame, sometimes for their personal gain and other times to help Nike with things like footwear research. The soccer lab has more than 20 cameras capable of capturing footage at up to 10,000 frames per second, which is a crucial factor when every little detail counts. The 3D motion-capture system is akin to what's used for animation films, but Nike's purpose is to re-create performance and model the foot and ball to see how they interact with each other in various scenarios. "We deal with a lot of the nerdy stuff in here," says Mike Amos, senior researcher at the Nike Sport Research Lab, "and we have some excellent designers that can help visualize that [data]." Despite all that research, VanHook says there were some tedious challenges during the design process. He points to the cuff around the ankle on the Magista 2, explaining how challenging it was to make an anatomical shape that offered support and comfort simultaneously. To do so, VanHook says he had to work closely with the knit team, and they eventually went through more than 120 panels of fabric and yarn before getting to the ideal shape. A themed Magista 2 will be worn by the USA women's national team at the 2016 Rio Olympics. So, how does all of this translate when you're wearing and playing in the Magista 2? The best way to describe the experience is that it feels like you're wearing a thick sock. Which is exactly what Nike had in mind. That said, it did take 15 to 20 minutes of running around to feel comfortable. At first, I thought I needed to go a size up, but the shoe eventually adjusted to my foot. After all, comfort is the least you can expect from a $300 pair of cleats (the indoor version is $175). With Magista 2, one of the features Nike is focusing on is ball grip, but I didn't notice much of a difference right away compared with other soccer shoes I own -- including the previous-gen Magista. Maybe that's something you'll notice with more wear and tear, as I only tested them for about two hours. At the end of the day, the Magista 2 isn't going to turn you into Cristiano Ronaldo, Neymar or Messi. But it is designed to improve your performance in training and during games. If nothing else, though, it's always nice to have the best-looking cleats on your rec team.